From a geophysical perspective by far the best nuclear waste storage location in Canada is the Jersey Emerald mine property which is located in the Columbia (Selkirk) Mountains of southern British Columbia. Jersey Emerald is a 5 million square foot naturally dry depleted Canadian hard rock mine with about 10 km of main access truck tunnels, 12 foot to 60 foot high internal storage vaults and a geology that is uniquely suitable for storage of radio isotopes and/or other highly toxic material. The Jersey Emerald workings are 200 m to 600 m below grade but are more than 300 m above the surrounding water table. The lower portions of Jersey Emerald are in extremely dense water tight granite. Jersey Emerald was a critical source of zinc, lead and tungsten during WWII but was closed in 1972 due to low commodity prices. Today Jersey Emerald is likely the most safe and secure facility in North America for nuclear material storage. The elevation of Jersey Emerald protects it from any possible future rise in sea level. The water tight structure of Jersey Emerald is demonstrated by the fact that the mine, although high in elevation, is presently filled with rain watter that has been intentionally collected since the 1970s. The surrounding rock is high in silica content so that a large water reserve will be required to suppress silica dust during any future rock cutting work. In 2013 Jersey Emerald and the surrounding property and mineral rights were available for purchase by OPG and/or NWMO at a price that was a small fraction of the projected cost of the Bruce DGRs. In August 2013 both the NWMO and OPG failed to even inspect Jersey Emerald when it was available to them, free and clear, complete with 4000 hectares of assembled surrounding property, including both surface and mineral rights, for $67.5 million. For an estimated additional $100 million NWMO/OPG could have acquired an additional 16,000 hectare exclusion zone, giving NWMO/OPG title to almost all surface and mineral rights within an 8 km radius of Jersey Emerald. The failure of both NWMO and OPG to place a $2 million dollar holding deposit on the Jersey Emerald property prior to December 13, 2013 will likely go down in history as the single worst management decision in the Canadian nuclear power industry. This matter is indicative of gross incompetence and/or corruption within the senior managements of both OPG and the NWMO. Shown on the map below are the main topographic features in the Jersey Emerald area. The Crows Nest Highway is a major east-west transportation link through the southern part of BC. The Town of Trail is at the extreme west edge of this map. From Trail follow the Crows Net highway east to Salmo (population 1027). Find the position of the border junction between the Province of British Columbia, the State of Washington and the State of Idaho. Jersey Emerald lies on a straight line between Salmo and that border junction, is 2.5 km east of the Crows Nest highway, is 10 km south of Salmo and is 12 km north of the British Columbia-Washington border. 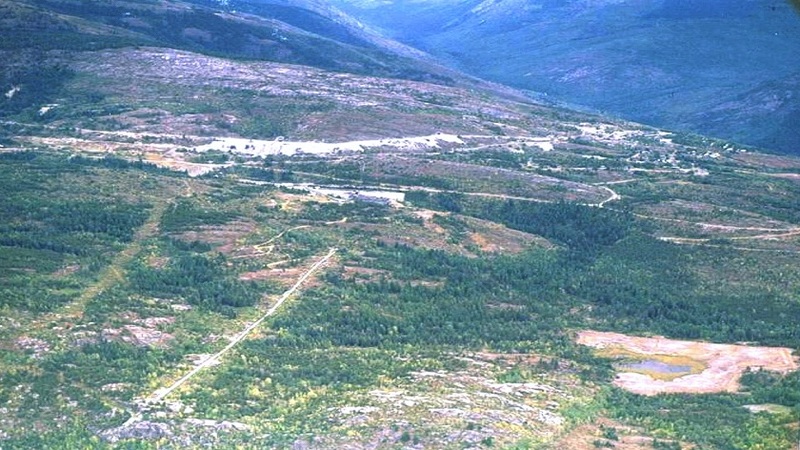 The valley of Sheep Creek marks the northern boundary of the Jersey Emerald mine property. The valley of Lost Creek marks the southern boundary of the Jersey Emerald mine property. The position of the Nevada Mountain peak about 10 km east of the Crows Nest highway marks the eastern limit of the Jersey Emerald mine property. The valley of the Salmo River marks the western boundary of the Jersey Emerald mine property. The mountain in which the Jersey Emerald mine is located is locally known as Iron Mountain. Iron Mountain is actually a broad western shoulder of Nevada Mountain. South of Iron Mountain is Lost Mountain. Jersey Emerald is the same site that Placer Dome's (formerly Placer Development) subsidiary Canadian Exploration Ltd. (locally known as Canex) operated from 1947 to 1974. In terms of driving the town of Trail is about 40 km west of Jersey Emerald and the town of Creston is about 50 km east of Jersey Emerald. The Jersey Emerald area is sparsely populated. Recent aerial photographs show a total of about 80 structures (homes, garages, barns, workshops, etc) within an 8 km radius from Jersey Emerald. The map below shows the location of Jersey Emerald with respect to water courses and the British Columbia - Washington border. Note that Sultan Minerals Inc. owns continuous subsurface rights extending south from Jersey Emerald along both sides of the highway to the British Columbia - Washington border. Sultan Minerals subsurface rights extend north almost to Salmo. Within the Jersey Emerald mine property there are other parties that own small patches of surface and subsurface rights. Jersey Emerald was a major zinc and tungsten mine that began production in 1941 to meet the zinc and tungsten requirements of the allied forces during World War II and was closed in 1973 due to prolonged low metal prices. 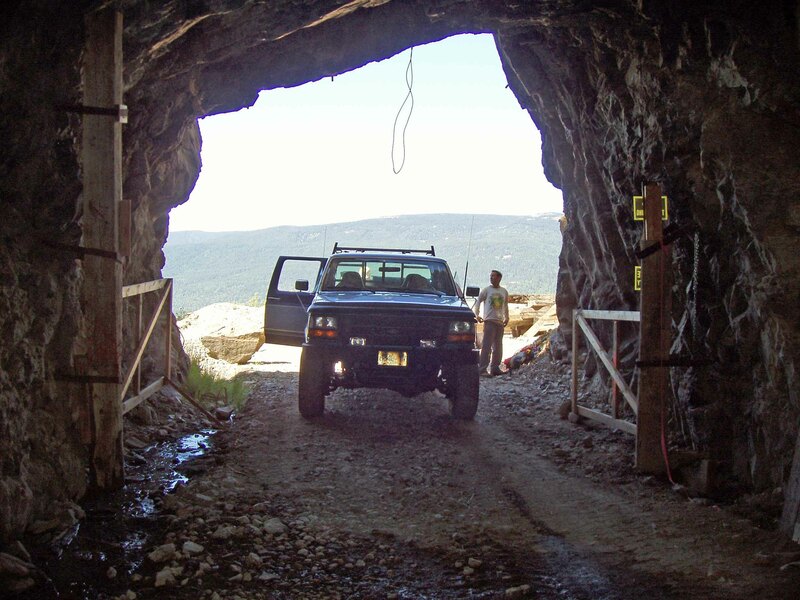 The mine property referred to as Jersey Emerald actually encompasses several adjacent mine workings which are individually known as Jersey Zinc, Invincible Tungsten, Dodger, Emerald Tungsten, and East Emerald. Each of these mine workings has at least one truck size entrance that initially goes almost horizontally into the mountain. The mining method was room and pillar and the ore bodies were nearly flat so the depleted mine has about 5 million square feet of open pillared naturally dry storage space in vaults varying in height from 12 feet to 60 feet. The pillars occupy about 10% of the gross mine volume. The original zinc ore body sloped at about 4 degrees from the horizontal, so internally the Jersey Zinc mine working gravity drains to the south. Between 1941 and 1972 about 10 million tons of ore were removed from Jersey Emerald. At peak production Jersey Emerald had a work force of over 1160 men. There is a Jersey Emerald town site, but after mine closure in 1972 all the buildings were removed. In the existing Jersey Emerald mine workings the overhead rock thickness varies from 200 m to 600 m, making Jersey Emerald a potential Deep Geologic Repository as defined by the Nuclear Waste Management Organization (NWMO). The hard rock mine structure is stable and does not need internal support except near the entrance portals where spring run off water penetration in combination with repeated freeze-thaw cycles make the rock unstable. The mine has been closed since 1973. For safety Sultan Minerals Inc. (Apex Resources Inc.) indicates that the ceilings of the workings should be scaled (tapped with a steel bar) before unprotected interior work is undertaken as there could be loose material remaining on the tunnel and vault ceilings. Such loose material is a result of the drill and blast technique that was used to form the tunnels and vaults. The Iron Mountain core is believed to be crack free due to stable water containment for over 40 years. The ceilings are believed to be stable because there have been no significant rock falls since the mine closed in 1973. From grade to about 200 m below grade the rock type is limestone. At depths greater than 200 m below grade the rock type is water tight crack free high density granite. The zinc ore body at Jersey was in the lower part of the limestone layer and was nearly flat, which led to the room and pillar mining methodology. The other ore bodiess are geometrically more complicated and occur around the periphery of the granite. The water table is at 800 m ASL (Above Sea Level). The workings are in the range 1100 m ASL to 1500 m ASL and the mountain upper surface is > 1700 m ASL. The elevation of the Jersey Emerald mine vaults is 300 m to 700 m above the surrounding water table, which makes Jersey Emerald naturally dry. Mining at Jersey Emerald is relatively expensive because process water has to be pumped so far uphill. There has been some effort to capture and store rain water to mitigate this problem. However, there is no external high elevation depression or lake, which contributes to the general mine dryness. The following map with coutour lines at 200 m elevation intervals shows the relative elevations around Jersey Emerald. 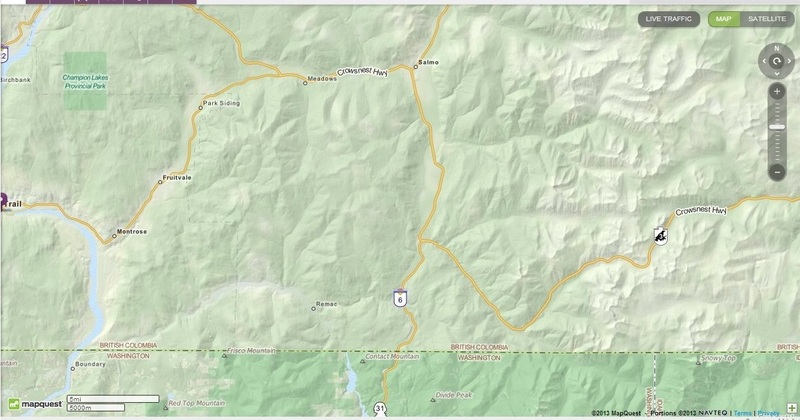 Note the 1000 m elevation difference between the Salmo River Valley bottom and the top region of Iron Mountain. Note also that the top ridge of Iron Mountain extends eastward about 7 km and then dips slightly before rising further up Nevada mountain. The subsurface at Jersey Emerald has been extensively explored and documented via tunnelling, diamond core drilling (~ 6000 holes), internal surveying and computer mapping. Three dimensional computer generated maps of the interior of Jersey Emerald are available. For historical documentary reasons the following mentioned elevations are in feet Above Sea Level (ASL). The existing Jersey Zinc workings are all more than 4000 feet ASL. The existing Jersey Zinc working entrances are at 4000 feet ASL, 4200 feet ASL. and 4400 feet ASL. The existing Jersey Zinc workings are about 200 m from the Iron Mountain surface. The existing Jersey Zinc workings include 4.0 km of tunnels that are designed to accommodate 25 ton diesel trucks. The minimum dimensions of these tunnels are 4.5 m high X 4.8 m wide. These workings naturally drain into Lost Creek at 2,600 feet ASL. The Jersey Zinc workings are particularly suitable for temporary storage of spent nuclear fuel recently removed from nuclear reactors because the Jersey Zinc workings have portals at different levels that provide excellent natural ventilation. The following aerial photo of the Jersey Zinc working looking ESE from the west side of Iron Mountain was taken circa 1969. The following two photos show two 25 ton truck size entrances into the Jersey Zinc working. The existing Dodger working entrance is at 4200 feet ASL. The existing Dodger workings include 2.0 km of tunnels that are designed for 35 ton diesel trucks. The minimum dimensions of these tunnels are 4.2 m high X 4.9 m wide. The Dodger workings are all more than 4000 feet ASL. Due to contained water the lowest 100 feet of the Dodger workings are known to be crack free. The Dodger workings can potentially be gravity drained by drilling a 2,500 foot long 122 mm OD X 85 mm ID drainage channel into the Lost Creek drainage system at an elevation of 2800 feet ASL. The cost of drilling this drainage channel is reasonably estimated to be $315,000. This working presently requires mechanical ventilation. The existing Invincible Tungsten working entrance is at 3900 feet ASL. The existing Invincible Tungsten workings include 1.5 km of tunnels that are designed for 45 ton diesel trucks. The minimum dimensions of these tunnels are 5.7 m high X 5.1 m wide. The existing Invincible Tungsten workings extend down to 400 m below the surface. The lowest elevation of these workings is at 3200 feet ASL. Due to contained stored water the rock is known to be crack free as high as the portal at 3900 feet ASL. The Invincible Tungsten mine potentially could be gravity drained by a 7000 foot long 122 mm OD X 85 mm ID drainage channel drilled into the Sheep Creek drainage system at an elevation of 2500 feet ASL. The cost of drilling this drainage channel is reasonably estimated to be $1,100,000. This working presently requires mechanical ventilation. The existing Emerald Tungsten working entrance is at 3850 feet ASL. 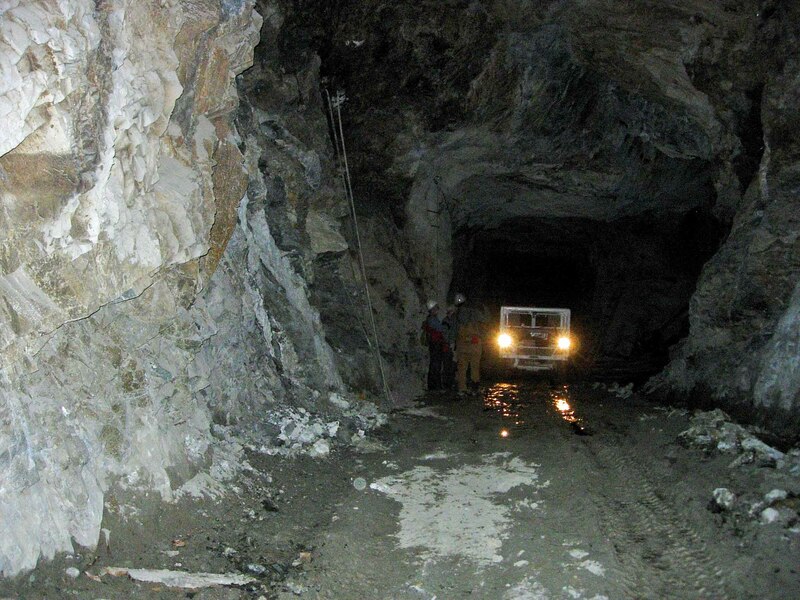 The existing Emerald Tungsten workings include 1.5 km of tunnels that are designed for track mining. The minimum dimensions of these tunnels are 4.0 m high X 4.0 m wide. The existing Emerald Tungsten workings extend down to 400 m below the surface. The lowest elevation in the Emerald Tungsten workings is at 2850 feet ASL. Due to contained stored water the rock is known to be crack free as at least as high as 3800 feet ASL. The near term plan for the Emerald workings is to use the stored water to provide process water for the other workings. The Emerald workings can potentially be gravity drained via a 5000 foot long 122 mm OD X 85 mm ID drainage channel drilled into the Sheep Creek drainage system at an elevation of 2,800 feet ASL. The cost of drilling this drainage channel is reasonably estimated to be $625,000. This working presently requires mechanical ventilation. The East Emerald working is a new discovery that has never been mined. Each existing mine working drains to a sump that facilitates water capture and site monitoring. The contained volume of the Jersey Emerald facility can be confirmed by measuring the volumes of the tailings piles. When the mine was closed in 1973 there were open drill holes on top that guided rainwater on the mountain surface into the workings and thence to the mine sumps. Over the next 20 years the smaller working sumps filled up with rain water. This stored water has considerable value for future mining operations. Modern computer based subsurface exploration techniques have shown that there is sufficient high grade ore remaining at the perimeter of Jersey Emerald to justify reopening the mine. From a mining perspective, a major problem at Jersey Emerald is lack of water. The Jersey Emerald mine is inherently naturally dry. In order to provide sufficient water for safe operation of mining equipment there has to be 100% capture, storage and recycling of all drainage water in the project area. Replacement water from Lost Creek has to be pumped about 2 km horizontally and vertically up about 600 m. However, the naturally dry conditions at Jersey Emerald make the site ideal from the perspective of storage of radioactive materials. There is sufficient space inside the mountain to expand the open floor area sixteen fold to 8 million m^2 while maintaining an 8 m (25 foot) ceiliing height, with 400 m to 600 m of overhead rock and keeping the vaults at least 300 m above the local water table. From a practical perspective the Jersey-Emerald site offers an enormous amount of relatively inexpensive secure dry storage for both spent nuclear fuel bundles and general radioactive waste, for as far into the future as anyone can reasonably project. Spent nuclear fuel bundles could easily be recovered from this site for future recycling in fast neutron reactors. For really long term storage of nuclear waste Sultan Minerals suggests driving a 2000 foot drift south from the Invincible workings and/or a 2,500 foot drift north from the Emerald workings. These tunnels would access a stable 4 km^2 area within the Emerald granite body below Iron Mountain that would be 400 m to 600 m below the surface. Storage chambers would have to be slashed out. This storage space would still be about 300 m above the local water table. The height of Iron Mountain is 5,100 feet ASL. With a little luck there might be enough molybdenum in the removed granite to recover much of the cost of drifting, slashing out the storage chambers and drilling drainage channels. An important feature of Jersey Emerald is potential for natural ventilation. The Jersey working was successfully naturally ventilated for the 30 years that it was open for mining. The same ventilation technique could be applied to the other workings to allow natural ventilation to remove heat emitted by decay of radio isotopes. Another important feature of Jersey Emerald is potential for gravity drainage from the top of the internal sumps. Hence the ongoing energy required to keep Jersey Emerald in operation as a storage facility is minimal. 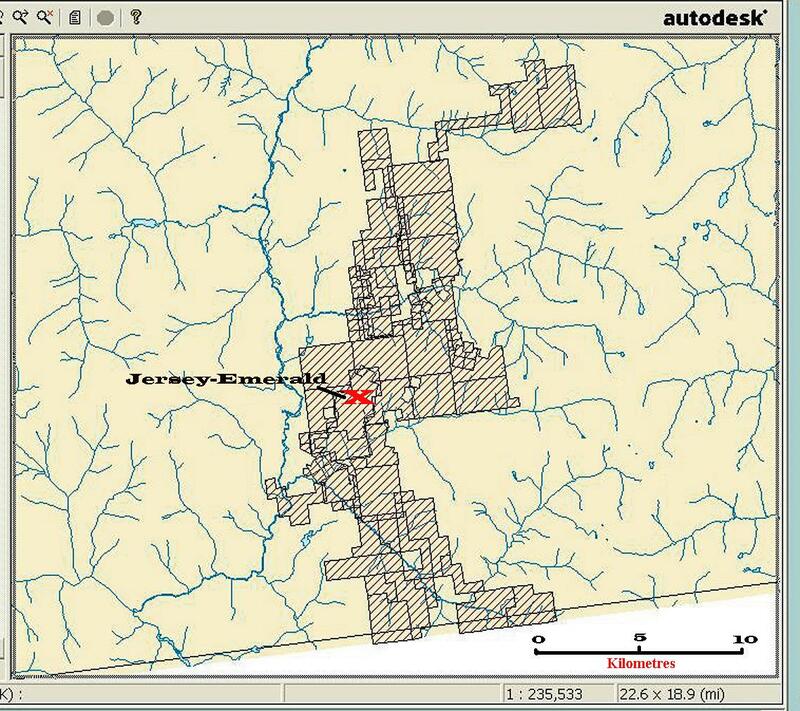 The Jersey-Emerald mine location is remote with almost no nearby habitation, simplifying site security. From a natural protection perspective the Columbia Mountains at the south end of the Selkirk mountain range provide some of the most challenging geography in North America. There is a BC Hydro electricity transmission line at a distance of about 4.0 km and a natural gas transmission pipeline at a distance of about 1.5 km from the Jersey Emerald mine property. There is an abandoned rail bed, part of which has fallen into private ownership, connecting the Jersey-Emerald mine property to the town of Trail, where ore concentrates from Jersey Emerald were processed. From Trail there are rail connections to the rest of Canada. Jersey Emerald could potentially be used today almost as is with minimal expenditure of funds. There is a list of all the drill holes together with their survey positions. There are survey markers inside the mine. The open drill holes presently used for rain water capture need to be identified and plugged. In order for these facilities to be used for long term dry storage one of the initial tasks is to pump out the accumulated stored rain water. The maximum permissible pumping rate, so as not to significantly impact local creeks, is 3000 gallons per minute. At that pumping rate the stored water could be removed in a few days. After all ore extraction is complete three gravity drainage channels should be drilled with directional drilling equipment. The mine sumps should be fitted with radiation and oil detection monitoring equipment. Tunnel lighting must be replaced. Nuclear spent fuel and nuclear waste containers can be trucked in and placed in existing vaults using rubber tire vehicles as are commonly used in the mining industry. Some additional site monitoring equipment is needed for security and safety purposes. Support personnel and their families could reside in the village of Salmo, about 10 km from Jersey Emerald. In the view of this author the Jersey Emerald site should be treated as a very large and extremely secure water tight warehouse with extensive natural radiation shielding and unmatched physical protection rather than as a burial pit. That approach gives maximum flexibility to future generations and enables easy rearrangement of the radioactive material as required for future material recycling, long term storage and mineral extraction. That approach also provides continuing certainty that the radioactive material is safely contained and isolated from the environment. Hence, the planned usage of the site should be for "secure interim storage" of the spent fuel bundles and nuclear waste with the aim of reprocessing and recycling in the future. The disadvantages of this site are almost entirely of a federal-provincial-NIMBY political nature. Spent nuclear fuel bundles and other nuclear waste would have to be placed in AECL/CNSC approved intermodal shipping containers and transported by rail from Ontario to Castlegar BC. Final transport to Jersey-Emerald would initially be by truck but could be by rail at a later date if the spur rail bed is reacquired and the railway track relaid. The local road bridges are rated for up to 80 ton trucks. At Jersey Emerald the nuclear waste and spent nuclear fuel bundles would be transferred from shipping containers to long term storage containers. One of the important features of Jersey Emerald is that Sultan Minerals Inc. (now Apex Resources Inc.) owns continuous mineral rights all the way from the Jersey Emerald vaults to the Canada-USA border on both sides of the existing highway. In principle a subsurface truck tunnel could be used to move radio active material from the USA to Jersey Emerald without ever entering space directly controlled by the BC government. The chemistry of the rock in that region permits forming such a tunnel without significant environmental consequences. If necessary the waste rock from forming such a tunnel could be stored within Jersey Emerald. Acquisition of this site would render most existing NWMO personnel redundant and would save Ontario electricity ratepayers at least $15 billion in projected NWMO facility development costs. The present surface uses are primarily legal cultivation of timber and illegal cultivation of marijuana. There is some ongoing interest in mineral exploitation of nearby properties such as at Swift Katie, about 5.5 km west of Jersey Emerald. Teck Corporation, the corporate successor to Cominco, also has some historic mineral rights in the area. From a site security, staffing and safety perspective it would likely be advantageous to purchase the Teck Corporation interest and to enable continuing economic mining activity. This site has substantial inherent value both because of readily accessible zinc, tungsten and molybdenum ore and because this site has long term potential value as a water tight toxic chemical waste dump. If the site is acquired for storage of radio active materials there is every reason to allow economic mining to continue. Such mining would provide ongoing employment for the local skilled trades persons who are required for further site development. This site resulted from a multi-billion dollar equivalent investment by Canadian taxpayers during WWII to meet the zinc and tungsten needs of the Allied armaments industry. The site, although closed for 40 years, has inherent value as a proven water tight toxic chemical waste dump. In this author's view acquision of this site could easily save Ontario electricity ratepayers in excess of $15 billion. It would be sad to see the unique geophysical features of this site lost to foreign control through failure of a Canadian entity to promptly act to acquire this site. A foreign purchaser might easily demand $10 billion for this site within less than 20 years. If this site is purchased by a foreign entity free trade agreements might allow this site to be used by foreign nuclear utility. Any activity at this site may be subject to approval by the relevant affected aboriginal organizations. The possible implications of storage of Canadian and US nuclear waste at Jersey Emerald are so wide that there should be some refereence to them in renegotitation of the Columbia River Treaty. 2. Building thousands of wind turbines. However BC, like Ontario, has electricity load concentration at its south western extremity. Regions of consistent high wind are remote from the load concentration. The high cost of building additional hydroelectric generation to balance wind power in combination with the high cost of transmitting wind power and balancing power long distances to the load will almost certainly make wind power prohibitively expensive. 3. Use of natural gas in combustion turbines. However, the BC population is more sensitive to green house gas issues than anywhere else in Canada. The BC forest industry, which used to be the biggest BC employer, has been enormously damaged by insect infestations that are directly attributable to global warming. 4. Nuclear power. British Columbia has a large immigrant population that is favorably disposed to nuclear power, provided that nuclear waste issues are properly managed. In this respect the BC population is likely to favor fast neutron reactors that potentially reduce the nuclear waste toxicity time from about 400,000 years to about 400 years and which achieve a 100 fold improvement in fuel utilization. British Columbia has centres of nuclear expertise both at TRIUMF, which is located on the UBC campus and at General Fusion Inc., which is located in Burnaby near the SFU campus. General Fusion has a requirement for a large amount of tritium, which can be formed in a lead-lithium blanket around a fast neutron reactor. It is this author's belief that when the electorate of BC is faced with the choice between these energy source options they will choose nuclear power. That choice would inherently defeat any provincial objection to use of the Jersey Emerald facility for nuclear fuel and nuclear waste storage. South central British Columbia presently has severe unemployment due to forest damage by insects as a result of global warming and due to depressed mineral commodity prices. One means of persuading the BC government to support use of Jersey Emerald for storage of radio active materials may be to simultaneously develop Jersey Emerald both as a radio active material storage site and as a working zinc, tungsten and molybdenum mine. The tungsten and zinc portions of this mineral development are detailed in a 63 page document titled: "SULTAN MINERALS INC EMERALD PROJECT" dated 18 January 2013. Since that date Sultan Minerals Inc. had a name change and is now known as Apex Resources Inc.